VWO Privacy Centers helps you configure what data you want to collect from your website visitors. Using this option, you can ensure visitor privacy by defining how and what level of data you would like to track from your website users. To access VWO Privacy Center, click the Settings icon and select Accounts tab. Under Accounts, select the Privacy Center tab. VWO stores location information for your website visitors including, country, region, and city information. Using the option, you can specify what level of visitor location information you want to store. If you do not want to track visitor location, simply uncheck the option. This option does not impact your geo-targeting for campaigns; it only decides how the location information is stored in VWO. ATTENTION You can use the location filter during reports segmentation, only if this option is enabled. For example, selecting Country Only option will store United States; Country & Region will store United States > Washington; Country, region, & city option will store the location as United States >Washington >Seattle. You can configure your privacy settings not to record or track any information of your website visitors. All modern browsers allow users to select if their activities on the browser can be tracked like website visited, and so on. If you select the Adhere to Do Not Track Settings, VWO app will respect the user’s browser settings and does not track any activity. However, if the option is not selected, VWO will track the user activity regardless of whether or not the user has configured Do Not Tracking option in their browser settings. ATTENTION If you are self-hosting your test files on your own server, the Adhere to Do Not Track feature does not work. You can use query parameters to filter information and anonymize user data before storing these on the VWO server. All anonymized query parameters are displayed as vwo_anonymized to the end user. By default, VWO detects information formats for email addresses and phone numbers and looks for query parameters that may contain authentication tokens, password, and user name. 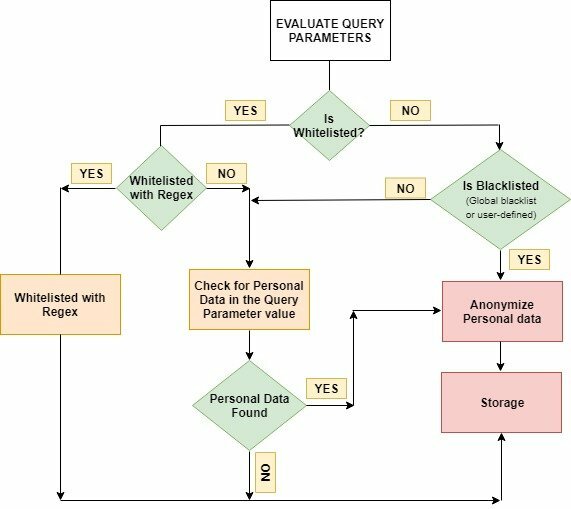 How Query Parameter Whitelisting Works? Every query parameter you have defined for your visitor traffic goes through a process at the back end to ensure that any personal information or data of your visitors are anonymized before storing. However, you can use the Blacklist and Whitelist section under Query Parameters to define the values you want to anonymize while storing or unhiding them. Sensitive user information and personal data of website visitors are blacklisted by default, unless these are specifically whitelisted by you. Please make sure that the regular expressions you enter do not contain ^ and $ characters. How to Locate your VWO UUID?